Bachelor of Science (3-year) (BSc), Chemistry Major, Brandon University, Brandon, Manitoba, 1993. Doctor of Naturopathic Medicine (ND), Canadian College of Naturopathic Medicine, Toronto, Ontario, 1997. 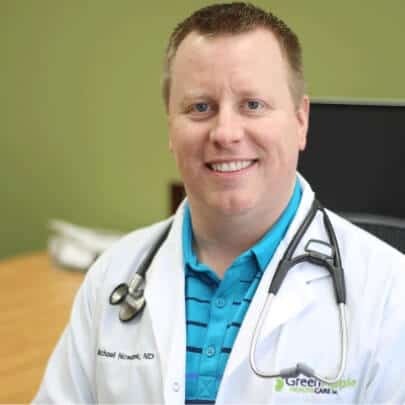 Dr. Michael Nowazek is the Clinical Director of Green Apple Health Care. He brings a wealth of knowledge from his extensive training and his many years experience as a naturopathic doctor. He was inspired to become a naturopathic doctor through his own experience with naturopathic medicine when, as a young man, he suffered a serious sports injury to his knee. Medical doctors told him that his knee would require surgery and that he would never walk properly again. Dr. Nowazek’s mother suggested he visit a naturopathic doctor for treatment. Despite his initial skepticism, he went to see if it would help. The naturopathic doctor he visited treated his injury with acupuncture, vitamin therapy, joint regeneration therapy, diet and nutrition. After 10 treatments, he was able to walk again. After further treatments, he was even able to resume martial arts training.This positive personal experience with naturopathic medicine inspired Dr. Nowazek to gain the knowledge of how to heal through natural means and to share that information with his patients.After four years of intensive study at the Canadian College of Naturopathic Medicine in Toronto, he graduated as a fully qualified Doctor of Naturopathic Medicine. Augmenting his studies in naturopathic medicine, Dr. Nowazek also has advanced training in a number of treatment areas including intravenous (IV) therapies, medical ozone therapy, high dose ascorbate and vitamin C therapy, chelation therapy, advanced medical life support, prolotherapy, and prolozone therapy. He has been practicing in Edmonton, Alberta since 1997. With the goal of better facilitating the healing power of nature, Dr. Nowazek started Green Apple Health Care to bring together the best of natural medicines with the best naturopathic practitioners available to create the most complete natural medical clinic in Northern Alberta. In addition to maintaining his busy practice, Dr. Nowazek has participated in provincial and federal naturopathic associations. He was president of the Alberta Association of Naturopathic Practitioners (AANP) from January 2000 to December 2007, during which time he oversaw all activities, including the drafting of the laws that now govern naturopathic medicine in the province. He is a past Vice President of the Canadian Association of Naturopathic Doctors (CAND). Dr. Nowazek treats a wide range of conditions and works with each patient to find the right treatment for their health issues.